SmartShare Tenant Inviter is the system which allows your tenants inviting the guests and partners to your home group, and keep their activity under your control. 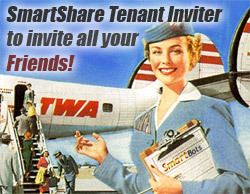 Automatic management, land owner’s web console, complete invite/eject history – you get this with SmartShare Tenant Inviter! Read more at SSTI’s SL marketplace page.